No matter how many players pick up fighting games as a competitive endeavor, there are always going to be certain character matchups that barely ever come up in tournaments, let alone in the later stages of a major event. Last weekend, Fighting Fest showcased one such matchup during its Street Fighter V finals, a battle of poison and stretchy limbs that provided a brief glimpse at how two uncommon characters deal with one another. Despite being underserved by Capcom, the Latin American region is full of incredible Street Fighter V players, most notably reigning Capcom Cup champion Saul “MenaRD” Mena. Fighting Fest, which takes place on MenaRD’s home turf of the Dominican Republic, played host to 112 competitors, many of which traveled from nearby countries to participate. One such player, Puerto Rico’s Ricardo “Mono” Roman, ran through a devastating gauntlet of Dominican talent, defeating Evo 2018 finalist Cristhoper “Caba” Rodriguez before coming face to face with lesser-known talent Luis “LuiMan20” Veras. Mono is a known quantity in the fighting game community due to his dedication to F.A.N.G.—a bizarre Street Fighter V newcomer who many consider the weakest character in the game—and a proclivity for travel that has allowed him to get some attention at tournaments outside Latin America. LuiMan20 is different. He rarely leaves the area surrounding his home in the Dominican Republic, but he does pretty well in his local scene. Before Fighting Fest, LuiMan20’s best performance came at Game Over Tournament last April, where he placed fifth after eliminating American visitor Kenneth “K-Brad” Bradley. Dhalsim, on the other hand, is the king of keepaway. By using his far-reaching attacks, fireballs, and teleports, he’s able to consistently put space between him and his opponent, feeling out situations and approaching when comfortable. The best word to describe Dhalsim is “deliberate,” in that every attack must be meticulously planned and backed up by several steps worth of strategy. While he’s not the most exciting character in the world for the average viewer, Dhalsim is the epitome of methodical, defensive play in Street Fighter V, and that can be thrilling in its own way. In this matchup, take note of how each player uses their respective character’s unique fireball. As F.A.N.G, Mono can throw out either straight or arced projectiles, both of which apply poison. The former deals no damage but also can’t be blocked or dissipated by other attacks, while the latter covers a decent amount of space above and in front of the character. LuiMan20’s Dhalsim has arcing fireballs too, but his traditional beeline Yoga Fire comes into play once he gains enough meter. Early on, both competitors filled the screen with projectiles, feeling the other out for any sign of weakness, and Mono in particular made great use of F.A.N.G’s parabolic fireballs to cover his approach and punish Dhalsim’s floating teleports. Mono’s experience, particularly in international tournaments, may have been the greatest deciding factor in his match against LuiMan20. Despite Dhalsim’s similar rarity in competition, Mono’s experience overseas has put him in front of a lot of different playstyles. F.A.N.G is a tough character to deal with once he gains momentum, whereas Dhalsim has difficulty mounting comebacks due to his painstakingly precise play. LuiMan20 seemed unsure of how to approach F.A.N.G through most of their battle, running into long-sleeved strikes and poisonous clouds consistently, and Mono took advantage of his opponent’s faltering. There were some moments of greatness thanks to LuiMan20’s ability to confirm seemingly stray hits into huge damage, but they were few and far between. Mono was firmly in control by the third and final game. Smelling blood in the water, he provided LuiMan20 little opportunity to escape, rushing Dhalsim down with a mixture of F.A.N.G’s screen-covering movement, arcing projectiles, and outlandish attacks. Although LuiMan20 was able to take the life lead in both rounds, Mono easily came back from these deficits, and closed out the match with one last devastating attack. 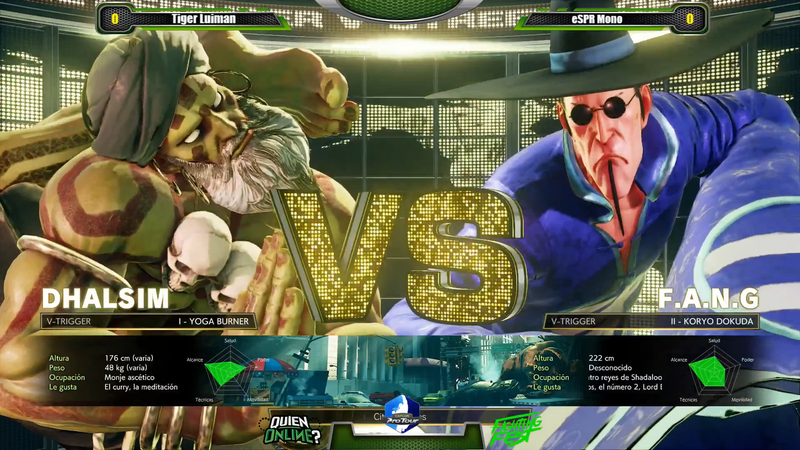 Despite the 3-0 score, Mono and LuiMan20 were able to provide an excellent look at the F.A.N.G vs. Dhalsim matchup. One would expect strategy to homogenize thanks to the fighting game community’s instant access to global match footage and the ability to discuss tactics with players worldwide, but unprecedented techniques are still being developed in singular pockets of the world. And, as Fighting Fest showed, Latin America is producing some of the community’s most distinctive matchups, not to mention the opportunity to see one of the best F.A.N.G players in the world do his thing.